So much has happened in the last thirteen years. Two generations of consoles, High Definition and another attempt to push 3D on an unsuspecting public to name but a few. But despite all this and more, in the world of gaming some things will remain as a constant forever, managing to throw off the shackles of time and its effects. Graphics may date, PC’s and consoles become obsolete but great games last forever and remind us why we loved those old rigs and bricks in the first place. 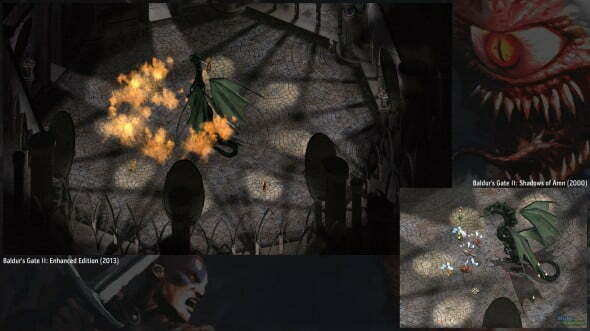 If asked for a fundamental example of this, few could compete with the legend that is Baldur’s Gate II: Shadows of Amn, the Bioware classic that succeeded in improving on a winning formula and standing in its own right simultaneously. It wasn’t for everyone back then and that hasn’t changed but the intention here was to restore to a modern standard not remake the game entirely. Thirteen years or not, it has to be said there is no better way to play this classic RPG than Baldur’s Gate II: Enhanced Edition. So let us begin with what is shiny and new about BeamDog’s Enhanced Edition. From the offset it is clear that this was never meant as anything but a modernised, re-release with some extra content. The visuals here are the same as they were all those years ago, however they now run in HD resolutions allowing for a more modern experience. A zoom function has also been included as a nice, if ultimately “double-edged” touch that serves to both enhance the game play in places but also show up some of the title’s older levels of pixilation. Subtle visual updates keep the games original charm intact. But the minor changes in the aesthetics are nowhere near the end when it comes to Baldur’s Gate II: Enhanced Edition’s new content. 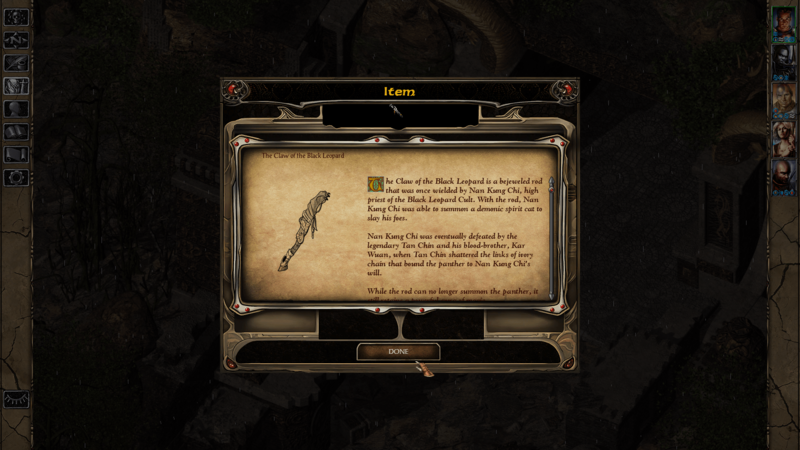 A quick-save option, new quick-looting and a decent help menu are all welcome additions here that will please both newcomers and veterans alike. However the most significant new content comes in the form of the new playable characters and their individual story arcs. 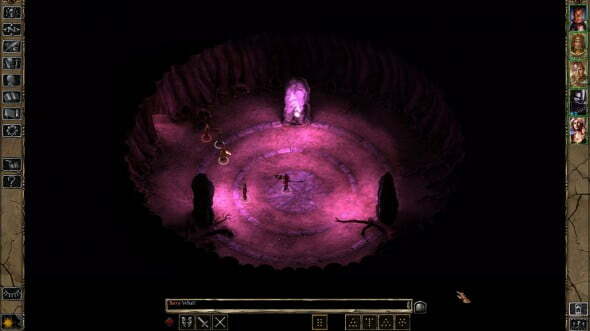 Three of the four new faces will be recognisable to any who played BeamDog’s Enhanced Edition of the original Baldur’s Gate, however this is far from a cut and paste job. All three returning newcomers are much more fun to use this time round (mainly due to Baldur’s Gate II’s much expanded combat system) and all of their story content fits seamlessly into the package, never once feeling out of place. This is even truer of the fourth new character – Hexxat, a female thief – who provides some of the best new content with her gripping, edgy tale. It is also worth noting that BGII: Enhanced Edition comes with the Throne of Bhaal expansion pack which again provides even more content to an already hour heavy RPG purchase. Menu systems are the same, but the new help menu goes a long way. 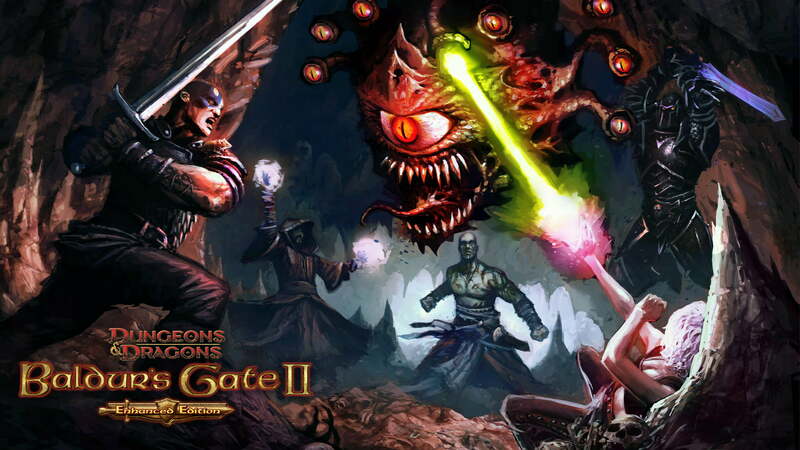 Despite all these positives, it should be pointed out here however that Baldur’s Gate was never a franchise to please everyone. It’s incredibly stat heavy, D&D (Dungeons and Dragons) based combat has always thrilled many with its depth but also put many off with its complexity. Both BeamDog’s Enhanced Editions are no exception to this meaning if you were not a fan back then, chances are you won’t be now. Despite a few issues here and there, BeamDog’s Baldur’s Gate II: Enhanced Edition is every bit as good as the original and more. The new content shines enough to warrant the purchase for veterans without upsetting the games original form and also culminates in sizable value for money for newcomers. The tweaks are all more than welcome and only serve to Enhance (pun intended) the experience and the HD resolution updates without robbing the franchise of its charm. If there’s one drawback here it’s that those who didn’t like the franchise before won’t be converted however it is clear that this was never the intention. And for those who look back on it fondly or just missed the opportunity 13 years ago, the time to dive in is definitely now.